By using drainage water management instead of conventional deep free drainage, producers conserve water, reduce fertilizer and nutrient loss to streams by 30 to 50%, and increase yields. Most cost effective on 0-1% slope. Install mains on steepest grades and laterals as long and on as flat of a grade as possible. 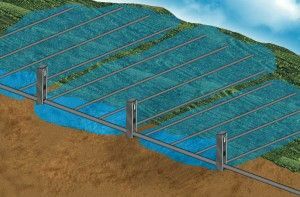 Install Water Level Control Structures in the main every 1′ to 2′ of elevation change. Some existing drainage systems can be retrofitted. Can be used to sub-irrigate crops. Cost share available to install and manage Smart Drainage System® in some areas. Top view showing the zones of influence that each structure manages. 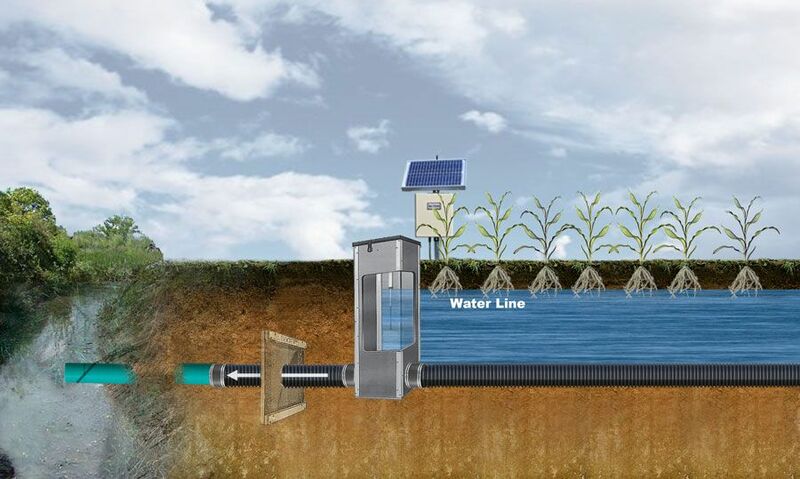 Typical drainage water managment installation with the Inline Water Level Control Structure™. The Inline Water Level Control Structure™ is designed to be installed in the pipe line, so the water enters the pipe, then flows into the box, over the stoplogs, then out the downstream side of the structure. Structures are available in either manual or automatic. Structures are constructed of rugged 1/2″ PVC. 5′ & 7″ stoplogs for adjustability. Available in 4″ to 24″ diameter pipe. Inline available in 2′, 3′, 4′, 5′, 6′, 8′, 10′, and 12′ heights. Flexible couplers allow PVC, plastic pipe, or other materials to be easily attached (specify when ordering).